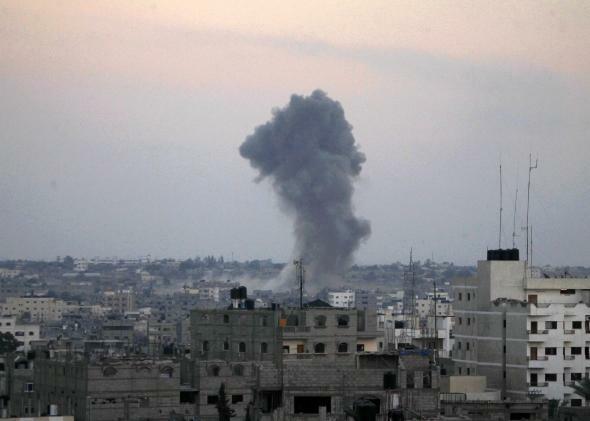 Smoke billows from buildings following an Israeli airstrike in Rafah, in the southern Gaza Strip, on July 31, 2014. The report looked at the airstrikes conducted against civilian apartment buildings during the bombardment of Gaza, finding that in at least six cases there was no information available as to why they “were considered to be legitimate military objectives” and that “there are strong indications that these attacks could be disproportionate, and therefore amount to a war crime.” It found the warnings given to civilians to evacuate areas under attack to be insufficient and criticized the controversial “roof knock” strategy, in which little or no explosive charge is dropped onto a building to warn of a larger attack to come. It found evidence of indiscriminate attacks, potentially amounting to war crimes, during the bloody ground incursion into Gaza’s Shejaiya neighborhood, which Secretary of State John Kerry sarcastically described in a memorable hot-mic moment as a “hell of a pinpoint operation.” It also criticized Israel for the shelling of several schools, including those administered by the U.N.; suggested that the use of Palestinian prisoners in inspecting tunnels and other facilities may constitute an illegal use of human shields; and took the Israeli military to task for its crackdown on Palestinian protests in the West Bank during the Gaza operation. As for Hamas, the report found evidence in that in some of the rocket attacks fired into Israel, there was “intent to direct those attacks against civilians.” Even indiscriminate attacks may in some cases be considered war crimes, under international law. It also found evidence that Hamas deliberately used Gaza’s civilian population to shield military assets, and in some cases encouraged civilians to remain in place, putting them at greater risk. It also detailed the summary execution of dozens of Hamas opponents in Gaza accused of being collaborators with Israel. The Israeli foreign ministry has already dismissed the report as the work of a “notoriously-biased institution, given an obviously-biased mandate, and initially headed by a grossly-biased chairperson.” (Education minister Naftali Bennett went further, accusing the report of having “blood on its hands.”) The initial chairman of the inquiry, the Canadian international law scholar William Schabas, resigned in February after acknowledging that he had previously done paid work for the Palestine Liberation Organization. His replacement, the American jurist Mary McCowan-Davis, had vowed to be more even-handed, but Israel still declined to participate in what it argued was a fundamentally biased investigation. Israel’s noncooperation meant the investigators were not able to travel to either Israel or the Palestinian territories. The government of Egypt also declined to facilitate their entry. So the investigation is based almost entirely on publicly available information compiled by NGOs, the media, and previous U.N. reports, and on interviews conducted in other countries or via Skype. Hamas and the Israeli government declined to answer questions from the commission. Only the Palestinian Authority, which has been pursuing a strategy of taking action against Israel in international bodies ranging from the International Criminal Court to FIFA, participated enthusiastically. These reports tend to follow something of a predictable and self-fulfilling pattern: Israel declines to participate in what it says is a biased investigation, the report comes out primarily reflecting a pro-Palestinian perspective, Israel then denounces the report as biased. The one thing may make this time slightly different is the International Criminal Court’s ongoing inquiry into war crimes committed in the Palestinian Territories. The ICC’s prosecutors could use the report as a road map for their own charges. Benjamin Netanyahu’s government isn’t going to cooperate with that investigation (the UNHRC’s recommendation that Israel join the court is almost a laughable nonstarter), and its allies, notably the United States, will do everything in their power to push back against charges, but it could advance the PA’s strategy to isolate Israel internationally. Judging by the report, Hamas is likely to face charges as well. But given that Palestinian President Mahmoud Abbas now seems to be distancing himself from his erstwhile allies in Gaza, that may suit him just fine.